Octoberfest/Ski & Snowboard Sale @ Pats Peak - Nov 3, 2019 - Henniker Chamber of Commerce, NH ? 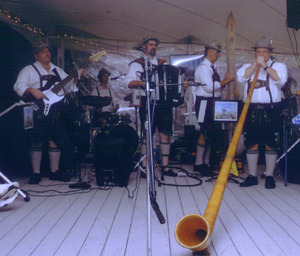 Join the fun at the annual Octoberfest celebration at Pats Peak with live music from 11am to 5pm with King Ludwig's Bavarian Band, an authentic German Oom-Pah-Pah-Band. Octoberfest also features a German Food Fest, Harpoon German Beer Garden, German Beer Stein Sale, Sing-a-longs and Kids' Activities. Chair Lift Rides will be available from 11 am to 3 pm for $5 per ride (weather permitting). There will also be a S&W Sports Mountain Bike Tent Sale, Woodsmen Show and a NH Cowboy Mounted Shooting Demo. In conjunction with Octoberfest is a Ski & Snowboard Sale from 11am to 3pm selling new and used equipment and accessories at great prices! If you would like to sell your used ski/snowboard equipment, you can drop off on Saturday from 10am to 3pm.